Those who love Traditional Method, will surely enjoy Italy’s version of this traditional method sparkling wine, Franciacorta, from the lake region in Lombardy, in Northern Italy. Like other world class sparkling wines, Franciacorta gets its bubbles thanks to a secondary fermentation in bottle; the same process as France’s traditional method and, like traditional method it is limited to a specific geographic area whose soil and climate has a distinct influence on the wine. However, in contrast to traditional method, production is limited and less than 12% of Franciacorta is exported. The rosé colour is obtained after brief maceration of red Pinot Nero grapes. Just a few hours are needed to get that special tint recalling springtime sunsets, then a delicate blending with Chardonnay and slow, patient maturation. 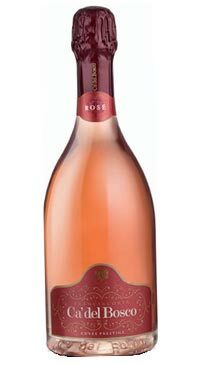 Cuvée Prestige Rosé, is the ideal sparkling wine for momentous occasions; especially the most romantic!